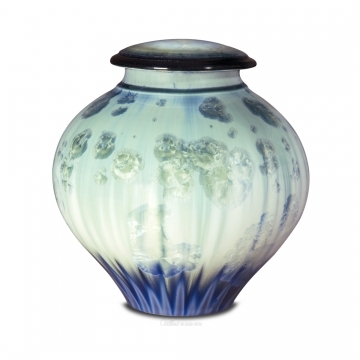 This porcelain cremation urn features spectacular color and a unique, crisp design. It has a crystalline glaze, fired to create a broad range of sparkling blues and greens. Since every porcelain urn is hand made, please allow for variances in the color intensity and design patterns.